2018 has been a year of changes and acceptance for me. It’s the year I fell in and out of love with a job I wanted dearly, moved back to Bombay after living my American dream, and resigned to the fact that I was having trouble accepting where my life was going. It has also been the year I finally admitted to myself that I’m bi-curious. To elucidate, I’m a cisgender female who has thus far identified as heterosexual, but has, for a couple of years now, realised that I may not be quite so hetero. I like and have dated men, but I like women too, and I’m curious about exploring romantic entanglements with them as well. For most of my life, I’ve only ever known myself to be a straight woman. It wasn’t until a few years ago that a little thought bubble emerged over my head, reminding me about the countless romantic encounters I’ve imagined with women, the same way I have with men. I gave myself the opportunity to slow down and explore what my sexual identity truly meant to me because it felt like it was constantly in motion. My journey began with exploring demisexuality, and considering whether or not I fell into the purview of the definition. A demisexual is a person who must establish a strong emotional connection with a person before being able to participate in a sexual or romantic relationship with them. Past experiences made me feel like I may be demi. Some even made me feel like I may be asexual! But as the days went by, one question grew bigger in my head: What about women? Sexuality and gender are fluid and ever-evolving. They grow with you and evolve as your thoughts, ideals, and beliefs evolve. My own experiences followed the same process of evolution. September 2017 was a month of new beginnings: a new job, new apartment, and new friends. One such friend happened to be more special than I anticipated, and I didn’t realise until much later why that was. M* and I met on the job–we bonded over our shared love for all things theatre, discovered mutual interests in quirkier things like knitting, and grew to care for each other for the weird specimens of the human form that we were. Somewhere along the way, however, my feelings for her grew beyond that of friendship, without me truly noticing them. I didn’t fully understand or accept these feelings until I moved back to India in June this year. A huge change in my physical space meant I was questioning everything in my mental space, including this. It meant realising that I was–and have been for a while now–sexually attracted to women. It meant realising that my romantic fantasies were linked with women I’ve had crushes on and not noticed. It meant understanding that there’s a big part of me that would like to know what it would be like to be romantic with a woman. Outside of my head. Because in my head there’s a lot more going on, I’ll be honest. I recounted the times I’d be nervous about seeing her. The times when I’d catch myself staring at her and find my interest piqued more than usual. I remembered the twinge of sadness I’d feel when she’d mention new crushes and happy dates. I thought back to the times we’d hang out at each other’s houses, and how I’d be worried about making the right impression in a private setting, despite the fact that we’d talked about everything and anything endlessly on so many other occasions, that we had no secrets. Guess that wasn’t quite the case with me. All these realisations brought with them their own set of fears. As someone who constantly worries about what everyone else thinks, this became another worry to add to the list. Will people think I’m just piggybacking onto the LGBTQIA+ community? Will they think I’m doing this just for fun? Is this some new fad I’m trying to associate myself with? IS THIS JUST A PHASE? It took weeks, if not months, of conversations with my friends and myself to realise my truth. Fact is, no one was and is permitted to question my sexuality besides me. Owning my truth was freeing. I decided to mention my bi-curiosity on my dating profile. While this decision has brought along a good match or two, there was (as is always the case) one little hiccup. On a recent date with a cisgender man, I was confronted with questions about how I knew if I was bisexual or not. This man, who seemed very open and understanding on text, was anything but in person. He told me he could never understand how someone could like another person of the same gender. He even asked if I was checking out women while on this date with him because my nervous tendencies meant I’d look away while speaking. He brought back all the fears I’d fought to keep at bay about my sexuality. His comments reminded me that I still wasn’t sure if this was a phase or not. Besides the MANY other terrible points, this man had to make, this one struck a nerve. I had to remind myself that if this was a phase, so be it. Our lives are filled with phases that we either turn into our truth or get over. But that’s our decision to make. We decide when and how to explore these sentiments. This man also asked me when I’d “decide” if I was bisexual or not. My answer? I haven’t really marked a date on the calendar! I’m not sure if this is a phase, or if I am truly bisexual, and I’m okay with that. This little lesson in self-exploration has helped me realise that understanding my sexual identity shouldn’t have to come with a deadline. I am still exploring. I’m swiping on women on dating apps and freaking out about how to start conversations with them. I’d only ever known to fear how I’d appear to men I was interested in romantically. This is new territory for me, and I’m proceeding in a way that pushes me out of my comfort zone just enough to take the next step. 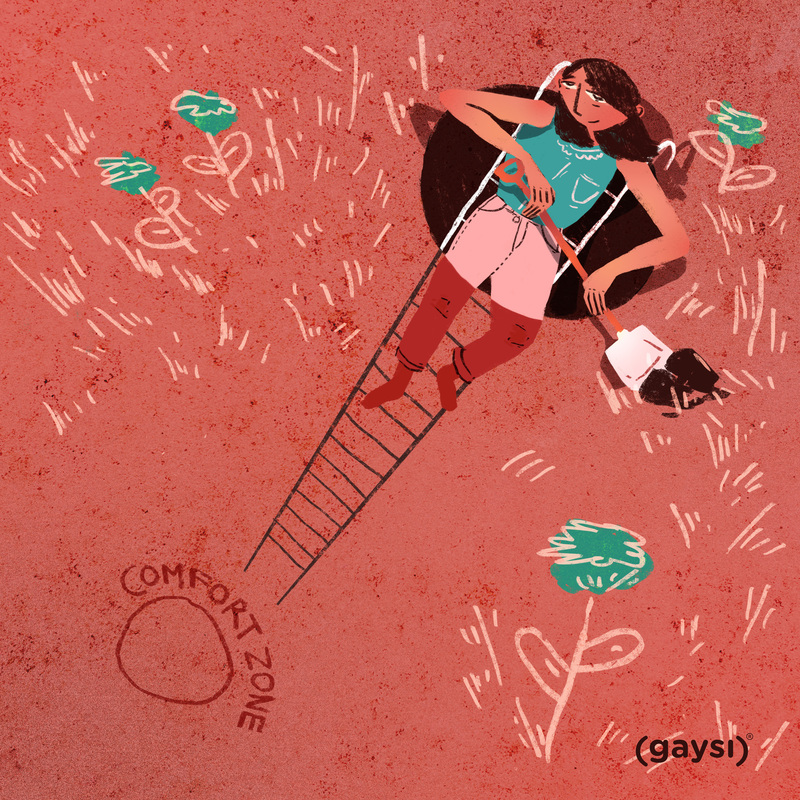 Thus far, I’ve always shied away from doing things that scare me, but owning my sexuality doesn’t scare me anymore. Well, most of the time. It’s good to know there shouldn’t be a deadline and that we can be uncertain of what may come find us . Reading this made me feel like I was reading how my 2018 has been. It felt like I wrote it. And this was a much needed confirmation because I have been thinking about the who “is is a phase concept?” while I am in a serious relationship with a girl from America (recently turned long distance) and I’m just coming out to my family!